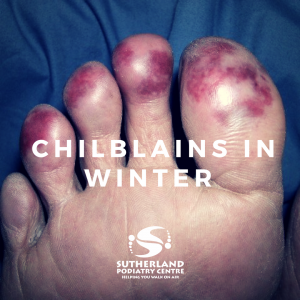 If the cold weather this winter is causing you itchy feet and there are small, red swellings around your toes which often become quite painful, then you may be suffering from a common condition called chilblains. These can occur on your hands and face as well as your feet and often affect those who work outdoors during the winter as well as elderly people or diabetics who are more susceptible to the cold because of poor circulation. Causes of chilblains can come from rapid changes in temperature but also from over exposure to damp environments. There may also be dietary influences and changes in your hormonal balance that mean you could be more prone than other people. Vigorous indoor exercise keeps the body warm. Your pharmacist may recommend an over-the-counter solution for less troublesome cases but consulting your doctor or seeing a qualified podiatrist who knows how best to manage the condition is often the best solution. If you are elderly and suffer from poor circulation this could involve having regular checks during the cold winter months to make sure your feet are in good condition. As always, if you have any questions, you can call us on 9542 3491. Or if you are suffering from this condition, come in and see us at our clinic!